1988; 289 pages. Genre : Waiting Room Filler. Overall Rating : B-. I've had occasion to spend a lot of time in doctors' waiting rooms these past three months. I learned quickly to take something to read with me, as waiting rooms have the worst magazines : Belly-Button Lint Illustrated; Oil Filter Digest; Healthy Yawning; etc. You get the idea. I never knew if my wait was going to be 2 minutes or 2 hours, so Dave Barry's Greatest Hits was an ideal book to take with me. Consisting of 81 of his 1980's newspaper columns for the Miami Herald, and at an average of 2 pages in length; there was always a convenient place to stop when finally called. Dave Barry is kind of an urbanized Bill Bryson. He is laugh-out-loud funny, and covers all sort of themes - current events, sports, politics, TV, history, etc. If you think he can only write about humorous absurdisms, think again. His column about the loss of his father ("A Million Words") will put a lump in your throat. The only drawback to this book is that it's dated. If you remember the 80's it's NBD. But if you don't, then his cracks about people like Gary Hart, Liberace, Caspar Weinberger, Chuck Colson, and the Paul Butterfield Blues Band may have you scratching your head. I recommend DBGH for the next time you have to get a physical. Everybody else in the waiting room will be jealous of you when you keep chuckling as you read. So I go in for my last words, because I have to go back home, and my mother and I agree I probably won't see him again. I sit next to him on the bed, hoping he can't see that I'm crying. "I love you, Dad," I say. He says : "I love you too. I'd like some oatmeal." So I go back out to the living room. where my mother and my wife and my son are sitting on the sofa, in a line, waiting for the outcome, and I say, "He wants some oatmeal." I am laughing and crying about this, My mother thinks maybe I should go back in and have a more meaningful last talk, but I don't. 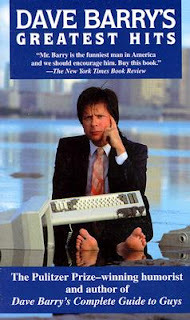 I love Dave Barry, but think I'd enjoy his stuff from the 90s more since I was still a little kid in the 80s. Sheesh, that last part was good. I read his column every Sunday. I love his end of year stuff too, and how he makes fun of everybody. one of the two longer pieces in this book was his "Year In Review - 1987". It was hilarious, but so much of it was dated that i couldn't use any of it as an excerpt. I enjoy reading end of year reviews. Hilarious or not? I like to see where we've been in a year so that part interests me. I might know some of the '80's stuff since I was in jr. high and high school then but some I may not remember.